At 4,237 feet above sea level, Sugarloaf Mountain is the second highest peak in the state of Maine. At its summit stands a large octagonal building which was once a restaurant as well as the upper station for a ski area gondola. The forbidding nature of the area in winter has earned it nicknames such as “Ice Station Zebra” and the “Ice Planet Hoth”. A ski patrol once found a stainless steel travel mug with a design by Gustav Klimt frozen in the ice outside the door of the summit building. Nobody knows what a mug like that was doing so far away from a good cup of coffee. He sat at the cafe at the side of the river, in the shade of a pretentious potted fern, along the street where much had happened over the years, working his way carefully through a large cup of dark coffee. It was important that he be careful with the coffee, and its consumption. This was not a thing to be taken lightly, this drinking. At first he would approach slowly, as he would a rattlesnake or strange dog, to avoid personal injury and possible litigation. Later, after he had determined the character, he would cozy up to it like a python on a bunny. He liked to savor his coffee, feeling the depth of the brew, the character of the bean, and the way it made him feel. The feel was the best when it was a good coffee, but that was not so often anymore. In that time it was hard to get a good clean cup of coffee, from the good honest beans that had parted reluctantly with their precious oils. He thought of a woman he had known, the one with the light hair and the darker, stronger character. When he was with her, he often found himself thinking of a good, strong cup; and later, in her absence, he found the good coffee made him think of her, too. This was after the Green Mountains, with their weak roast and their big ad copy. The Starbucks had come later, with their glossy fliers and their countertop gadgetry. They had swaggered into town, picking fights with the local roasters, putting big numbers of volume in front of their faces to scare them away. Often, the smaller merchants would leave in the night, leaving behind the big glass storefronts dark with the shame that goes with the defeat. Some of them should have gone on their own, as they cooked up an evil bean that was no good; but in the end that didn’t make it right. This was still before the Peets. There had been talk of the Peets, coming first from the mountainous regions, and also from the west, coming down from the hills cup by cup, brought by the Swedes and Norwegians, or at least by those who used their products or imagined the same lineage. Peets meant quality and consistency, and would not easily be drawn into the fight for market share. Let others scrap in the streets with the big talk over the small margins and the bigger overhead. Resting in the hot afternoon sun with his mug and anisette biscotti, he tried to remember how many shops there were nearby that would try to sell coffee to the unwary. As he watched the summer tourists flow back and forth, he was reminded of the time on safari in Africa, when they had stopped for awhile to watch the hyenas and the wildebeest. They watched from the roofs of the Land Rovers as the hyenas worked to cut out the weak and sick from the herd, taking them to the ground without much ceremony. It was not that different here, he thought, as he watched a skinny lad in a striped shirt and the practiced saunter pass into the near cafe, the one with the name that meant nothing. He found himself mouthing ‘hazlenut,’speculatively, as the youth emerged with a large paper cup the size of a milkshake. It was often said that competition was good for business, but all that came of it was a bad taste in the mouth. No one, it seemed, would make the coffee the way it was meant to be made. It was all for the dinero , the almighty dollar. The shops in the marketplace had the brightly colored awnings, and the wire chairs on the sidewalks, wire the color of the sky right before a heavy rain; or the white of a good, heavy writing paper; or the green that came to the eye like the English countryside in the early part of the year. They could have these things outside, and inside a clean, well lighted space that made it easier to make your order, easier to see the displays. It was to take better advantage of the dilletantes , with their lattes and their double decafs . They were not real, these drinkers. Mostly they took their coffee with the training wheels, the hazlenuts, the snickerdoodles, the raspberry and vanillas. They went after the beans that were painted up like the cheap women on the streets, easy to approach and good with the tongue; only later, when it was over, leaving a bad taste in the mouth, and the regret, which was worse than the bad taste. Nowhere, could the aficionados, the ones with the passion for the bean, find an honest cup. He remembered the time, against his better judgement, he had ordered the ‘mocha, short’, in the strange cafe with the big sign and the high ceilings. He was tired that morning, and he had been caught off-guard. The sun had been in the sky for too long already , and it was necessary to do what had to be done. The barista spoke the words of the ignorant, of the McDonalds and Dunkin’ Donuts; that they had only small, medium, and the large, but no short. He had to explain it to her, realizing only later that it had been a sign he should not ignore, but then it was too late. As a hot chocolate it was good enough, but he wanted the bean, with its honest, strong flavor, and the taste that lingered on the tongue like the good memory of a good woman. Instead he was left with the sticky-sweet feeling in the mouth and an empty feeling in the stomach, where it always hit him hardest. Damn that Barista and her infernal Macchine! He would not go again to that cafe with its painted face and its taste of regret. As the shade of the potted fern moved further across the dusty sidewalk, he recalled the first time he had brought her a cup of coffee in bed. They were staying in a small cottage on a big hill near the old foundation of a grand hotel from another era. It was in the place where ski instruction had begun in America, long before the Intrawests, the Booth Creeks, the American Ski Company and Vail Associates. It was late in the year, when you could find icy frost on window glass and fallen leaves in the morning, and by noon the sun would be warm enough so that the trees, in that heart of Autumn, seemed truly on fire. It was presspot, the way he always made it when he travelled, so as not to be at the mercy of an underpowered machine. At that time he was still working out the ratios, and had not yet discovered the few seconds of cooling from the boil, followed by infusion at the bottom of the melior. It was important that the grounds and the water have a little time to themselves before they got down to business, he thought, much like with men and women. As he offered the cup, he had that moment of insecurity, of hesitance, when he almost offered a pre-emptive apology. No! He thought, that would be weakness and that must not come out. The coffee would be good, as it always was when he had made it with honest beans and good intent. If she was worthly of him and his burr-grinder, she would find a way to grapple and come to terms with a real cup of java. Afterwards, when they lay there with the sun working its way through the birch trees and into the window, and the mugs sat together on the nightstand, he felt as though something in him had changed. Maybe it was not a change from within, but that he had the ability to change people , to have an effect on others who had not yet realized the possibilities of the bean, among other things. She had been pleasantly surprised by his coffee, and would later come to regard it as something of a standard, referring to others laughingly as “water with a bit of dirt in it.” They went hunting that day for the gold filter, which was rarely seen in those parts, and when it was, one had to make a sacrifice, a tribute few were willing to make. He slept well that night, without any caffeine jitters and imagined himself in the ancient port of Mocca, haggling with the local merchants for a particularly select sack of ripe beans. All that was a long time ago, in another place, he thought to himself, as he finished off his cup and brushed the few crumbs of his biscotti into his handkerchief. He realized he had stayed too long at this table, with its glass top and metal legs. The table top was empty, cleared of his own memories and habits, ready to take on those of another ; maybe not today, maybe not tomorrow, but soon, and at least for the rest of the life of this simple cafe. He removed the glass jar of beans from his pack, the one with the rubber gasket at the top, and made sure the wire latch was solid. Beside the jar he placed his measuring spoon, the aluminum one in the shape of an oval; he did not care for the feel of the round spoons. The Technivorm he placed back in its foam-padded aluminum case with the two catches to hold it closed. This machine he had brought back from Holland, and at first he was ridiculed for spending so much on such a device. 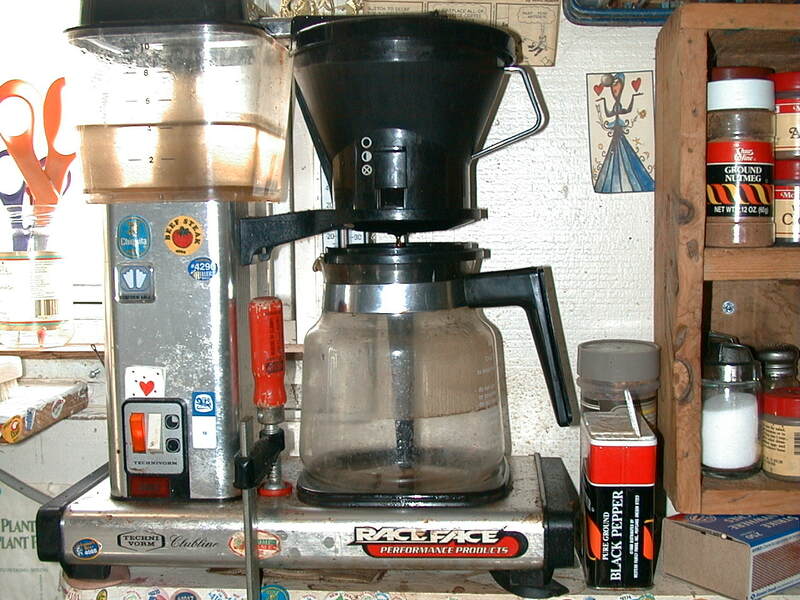 Later, when they had a chance to watch it work and tasted the coffee, they hadn’t made fun of him anymore, and he found he was invited to more dinner parties, where inevitably, he was depended upon to“make the coffee”. Next he coiled up his twenty -five foot extension cord, the one with the custom Hubbell receptacles, which he placed on top of the aluminum case. He had studied some of the principles of electricity back when he was in the Peace Corps. He often had to repair the generators which always broke down at the worst possible times, usually in the middle of a double pull of espresso. A good heating element required the right voltage and current flow, which couldn’t be trusted to a light-gauge cord when you were out in the field. With the cord he placed his selection of outlet adapters: the two and three prong, the european 220s, and the larger twist locks with the step-down transformers and phase converters. Last, he set the liter bottle of water and the stainless thermos beside the other items, and, satisfied that they were all secure, placed them back in his pack, Clipping his mug to a loop on the outside of the pack, he took one last look around to make sure that he had left nothing behind, then lowered his sunglasses as he turned and began to walk into the sun, which was now low on the horizon. Behind him, a young couple emerged from their sport utility vehicle at the curb, and cautiously approached the empty table, as though it might bite them. Satisfied that there was no E-coli or salmonella in the immediate area, she laid claim to the spot, as he strode confidently inside, ordering up two ‘latte grande’ as his sport-utility sandals squeaked across the shiny tile floor. Written just prior to the opening of Peets in Cambridge, Mass.